Why has the arrival of the first high wave of the US shale LNG to Europe remained overdue as well as a promise to overflow the European gas market? Anticipation of the first high wave of shale LNG supplies arriving from the US to Europe would be obviously dragged on further. Back in September last year, during the interview given to "Turkish Policy Quarterly" Amos Hochstein Special Envoy and Coordinator for International Energy Affairs leading the Bureau of Energy Resources (ENR) at the US Department of State stated, "The first LNG exports are poised to begin as early as this December." The European Union, as usual, is attentively listening to the words of its leading Atlantic partner. Promises from Washington regarding an imminent arrival of shale LNG should give more confidence, at least at a high political level of the EU, that, thanks to their fulfillment, Brussels will have more opportunities to implement its proposals formulated in the new "Energy Security Package" released by the European Commission in February. The economic reality is that the EC is required to increase gas imports to achieve the objectives adopted by the 2015 Paris Climate Conference, to cover the growing energy needs of households and industrial entities, to develop new areas of natural gas applications such as using natural gas as a transport fuel in Europe. And above all, there is a great challenge of energy poverty, which has long been acute especially in the South East Europe countries. As many of us are aware concerning gas, we cannot expect the production development in Europe. Domestic gas production accounted for 34% of gross inland consumption in 2013, and this share has been steadily shrinking further. For example, the Netherlands covered its consumption through national production by 47% and this country was the fifth largest natural gas exporter in the world. However, because of production cut the Netherlands is going to change from being a net exporter into a net importer of gas. The new "Energy Security Package" presented by the European Commission provides detailed proposals on the key issue of how to ensure gas supplies for a sustainable development of the member-states. Meanwhile, probably many more people in the EU countries have not found in these proposals convincing economic justification. The European Commission's proposals, as in the past, but this time even to a greater extent contain political aspects, when energy policy context clearly prevails over economic feasibility, although the latter is precisely what is of most interest to all end gas consumers and gas undertakings in the member-states. One feature of these proposals is that the drafters of the new energy strategy continue making it with such a political compass that for the last years has led in the same direction to reducing energy cooperation with Russia in the gas sector, citing the needs for energy security. This mode of the EU energy policy making obviously complicates the task of guaranteeing the future gas supplies, as it attempts to divert consumers in Europe away from Russian pipeline gas, which ensures about a third of the total gas consumption and even much more in some of the member-states, without offering an adequate replacement. As stated regarding such a scenario in the documents of the new Energy Security Package, "Russian volumes would have to be replaced mostly by increased LNG imports, given the limited availability of other sources." At the same time, we have to give credit to the authors of the new Energy Security Package that in its documents related to the EU LNG and gas storage strategy they speak in a rather temperate manner about the prospects of increasing LNG imports into the EU at the expense of shale LNG supplies from the US. As it is stipulated by one of the action points of the EU LNG and gas storage strategy, "Priority should also continue to be given to high level energy dialogues with Algeria, the US and Canada." This is correct that they put Algeria in the first place. As we know, this country is one of the main LNG supplier in the EU. More than 90% of Algeria's LNG exports were sent to Europe, primarily to France, Turkey, and Spain. We should nevertheless not ignore the fact that the second place in this short list for the US shale LNG without a proved experience of supplies to the EU countries can be considered only as a great credit of faith in the US promises regarding the first high wave of shale LNG that seems to be shortly reaching Europe. However, there are several reasons that actually hinder the fulfilment of these promises. In this case, it is not sufficient to demonstrate a political willingness on both sides of the Atlantic. Most of these reasons are too well-known to all who are familiar with current state of the world energy market. Let us consider at least three reasons creating barriers on the way from upstream market segment (shale gas production) to downstream segment (sales of shale LNG to for undertakings of gas traders and suppliers at the EC market). 1. The deepening decline in the US shale production. The Wall Street Journal reported that the U.S. Shale Producers Cut Output - Continental Resources Inc., Devon Energy Corp. and Marathon Oil Corp. plan to pull roughly 10% less from the ground in 2016 than they did last year. There are even more pessimistic forecasts of Energy Intelligence, warning investors that the actual peak of US shale industry development has long passed and this industry is expected to have negative growth of shale oil production in 2016 as shown in the graph below. The situation is similar with regard to gas production at shale plays in the US. According to EIA information published in "LNG North America Journal" in January 2016, natural gas production across all major US shale regions are seen declining. Substantial drop in rig counts since mid-2014 can no longer be compensated by productivity gains. For this reason, EIA anticipated gas production would decline within one month alone from 44.3 Bcf/d in December 2015 to just over 43.9 Bcf/d in January 2016. As it turned out, the US shale industry was not prepared to withstand the pressure of oversupply and low prices on the world oil market. Now none of us has the foresight to see exactly when such a negative effect may become at least a little bit less. On the contrary, pessimism in the projections is greater than ever. For example, Jim Teague, Executive Vice President of Enterprise Products Partners L.P., one of the biggest pipeline companies in the U.S., said to The Wall Street Journal that he could not predict how long the pain in the oil patch will last. "I don’t have a clue how low crude oil is going to go, how long it’s going to stay there, or what normal’s going to look like" when things finally stabilize, he said. "People keep calling it a cycle. I call it pure hell." In addition to low oil prices, tightening competition will reset LNG prices even lower, cutting off delivery opportunities for the US suppliers in Asia as well as in Europe. According to March edition of "LNG North America Journal", Brent is forecast to average 38 USD/bbl in 2016, while Henry Hub spot gas prices keep dropping below 2 USD/mmBtu threshold. Not only that oil prices drop drags down prices for LNG, along with it, there are also several new large-scale LNG capacities to be launched soon. For example, at the same time with start-up of new LNG capacities in the US it is planned to complete the construction of Gorgon LNG project on Barrow Island in Western Australia in the coming months. Up to now, this is the most expensive project in the history of the LNG development - with a capacity of 15.6 million tons per annum (MTPA) it will cost 54 billion USD. Australian Petroleum Production and Exploration Association says that Australia is on track to overtake Qatar to become the world's largest exporter of liquefied natural gas in 2018. The total value of Australian LNG projects exceeds 180 billion USD. By 2017, total LNG production capacity in this country will reach 53 MTPA. 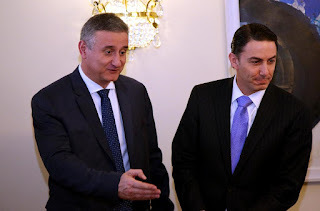 Amos Hochstein, the Special Envoy and Coordinator for International Energy Affairs leading the Bureau of Energy Resources (ENR) at the U.S. Department of State paid a visit to Zagreb, where he actively supported the Croatian government's intention to create the LNG terminal on the island of Krk. A special interest of the United States to such a small Balkan country like Croatia appearing as if out of nowhere, in fact is quite evident. The reason, of course, is that at once two European countries changed their mind to purchase shale LNG from the US although Cheniere Company, the leading US exporter of LNG had already included them into the list of their prospective customers. At first in mid-January, Lithuania put plans to buy LNG from the US on hold. "We are not buying gas from the U.S., because the gas they are offering at the moment does not meet specifications needed for our gas distribution system," Ernesta Dapkiene, a spokeswoman for Lietuvos Energija, told Reuters. Two weeks later this time Greece hit the Cheniere Company’s plans hard. The new CEO of Greek state gas supplier Depa, Theodoros Kitsakos, revealed the company's mid-term strategy. Kitsakos expressed uncertainty about a planned LNG terminal to be constructed in Alexandroupolis by the GasTrade Greek Company and the part it will play in supplying the IGB. As pointed out by the CEO, should GasTrade agree to LNG delivery from Cheniere Company in the future, pricing will be a key issue. Currently Greece imports gas from Gazprom at a price of between 4.6 and 4.7 USD/mn Btu, Kitsakos said; from Turkey's Botas at 5.9 USD/mn Btu; and from Algeria's Sonatrach at 6.5 USD/mn Btu. Gas at the Dutch TTF is around 6 USD/mn Btu. However, the price Cheniere Company will ask for gas is rumored to be around 7 USD/mn Btu. Thus, the US LNG exporters are now viewing Croatia as an extremely important client, which can become regular customer. In fact there no any other such clients for Cheniere Company in Europe yet. However, despite the foregoing, there are also some more or less optimistic assessments of the future development of the LNG market as well as prospects for its supplies to Europe sometime in the future. This is reflected by the forecasts made by British Petroleum Research Center. Besides a representative of another well-known British center for advanced energy research - the Oxford Institute for Energy Studies, David Ledesma found a very figurative picture of the future of the US LNG supplies to the European market. Speaking at the European Gas Conference in Vienna, he creatively expressed his opinion that now many of us in Europe are like a "rabbit staring into the headlights of a car coming towards us. We do not know what to do, and are having to think through new strategies…"
"Just look down the road and tell me if you can see either of them." I see nobody on the road," said Alice. I only wish I had such eyes," the King remarked in a fretful tone. "To be able to see Nobody! And at such a distance too!" Why should all of us in Europe, instead of trying to see "Nobody" behind the Atlantic horizon, better think well, where to buy enough gas for sustainable development?